View Day 6 of our Disney vacation HERE! Our final park day dawned cloudy, gloomy, and rainy. It had rained all night and didn't look like it was letting up. Fortunately we had parked under a structure so didn't have to get our luggage too wet. We left the car there and walked out to the shuttle buses that take people from Cabana Bay to the Universal CityWalk, which bridges the two parks. 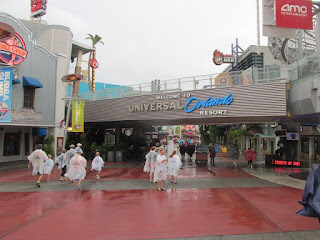 You need to go through CityWalk to get to Universal Studios or Islands of Adventure. There were a ton of people waiting, but after a few minutes three buses drove up and started loading up guests simultaneously. We didn't wait long after that. Our bus driver was very informative and gave a lot of helpful suggestions, even though we (Mom, Dad, and I) weren't very interested in most of his information. 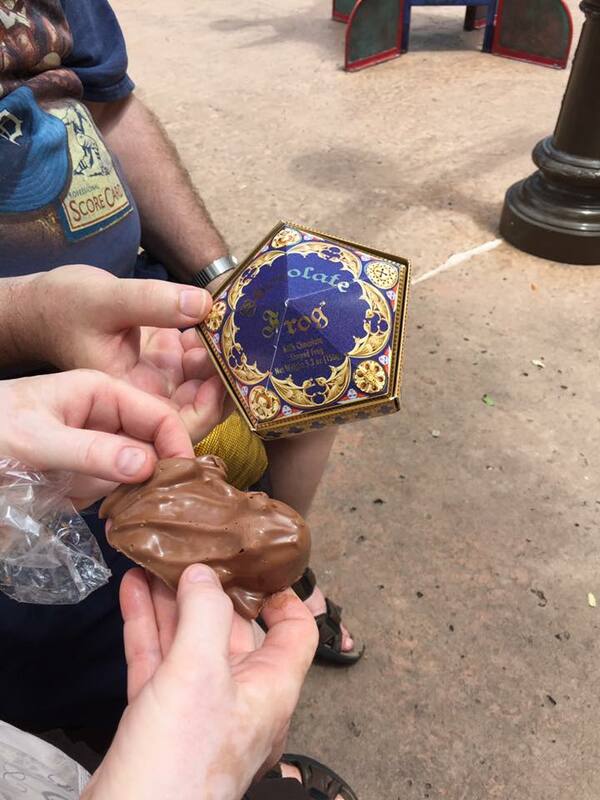 It was the last day of the trip, and we had one goal in mind: conquer the Wizarding World of Harry Potter. The walk was a long one, and we were wearing our rain sandals instead of our cushy walking shoes, so our feet weren't in the greatest shape. 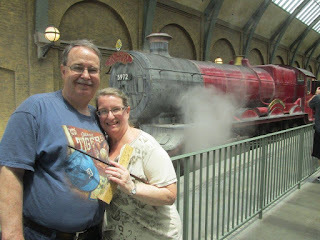 Mom wished there was a train that took people from the front of the park to the back, because that's where Hogsmeade is! The rest of the park hadn't opened yet, so everyone was a Universal Resort hotel tenant and were going to Hogsmeade. 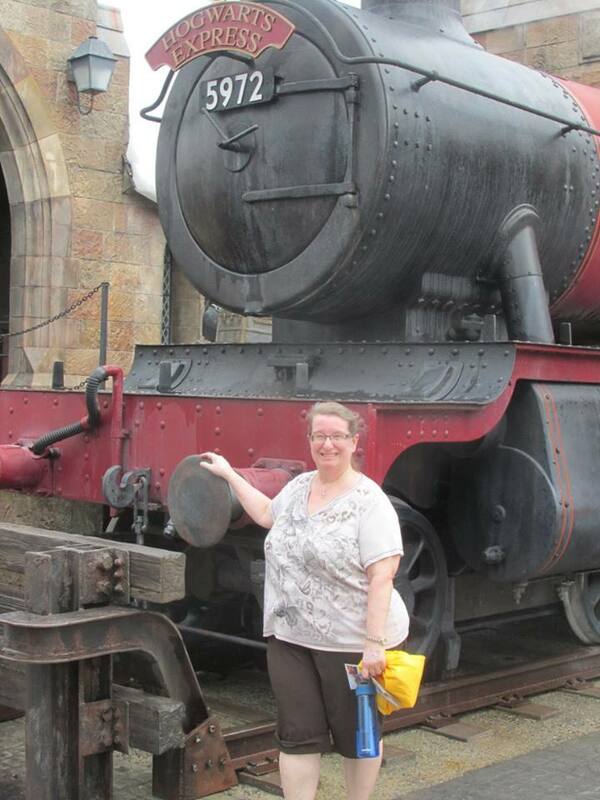 I was there pretty much for Mom's reaction, and it was priceless, especially with the Hogwarts Express train parked right in front. We walked through the village and got to the entrance for Hogwarts castle. We gave Dad all of our stuff, since I knew full well this attraction was not calm enough for him, and headed in. He made his way over to the Three Broomsticks, which wasn't at all busy at this time in the day. I had always done the single rider line when I rode Harry Potter and the Forbidden Journey, but had never done the full queue. 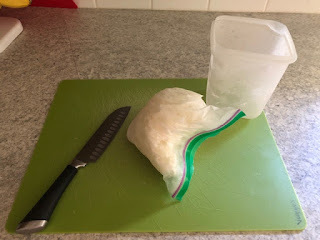 This was my chance with Mom, and we both loved it! We started out in the greenhouses, entered the building, saw the entrance to Dumbledore's office and the office itself (with the Pensieve! 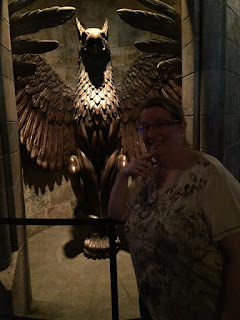 ), walked through the Defense Against the Dark Arts classroom (with Harry, Ron, and Hermione there), saw many moving paintings including the portrait of the Fat Lady, and had a conversation with the Sorting Hat before finally making it to the ride vehicles. We had a bit of a wait right before the Sorting Hat because the ride broke down, but it was about 15 minutes and we were back up again. This attraction makes me pretty motion sick, and I can't handle more than one ride each day. It's a great attraction, but you are really moved around! I was worried about Mom, but I shouldn't have - she loved it! She loved it so much she wanted to do it again right away, but I vetoed her. We found Dad and headed for the Hogwarts Express. It was after 9 and the rest of the parks were open, so we could take the train to Diagon Alley. The wait wasn't long at all, and we got to enjoy the amazing windows they have in the train. We wandered slowly down Diagon Alley, taking in all of the sights and little details. You can go into shops like the Owlery or Ollivander's and other shops are locked, like The Daily Prophet and Flourish and Blotts. We made our way down to Gringotts Bank and went on the ride there. Dad went on this one, too, so we had to drop off our stuff in one of the lockers they have. The lockers are free for the first hour, and you get one by typing onto a screen and the screen tells you the locker to use and unlocks it. Then to unlock it, you type in the code they've given you earlier and it unlocks it again. 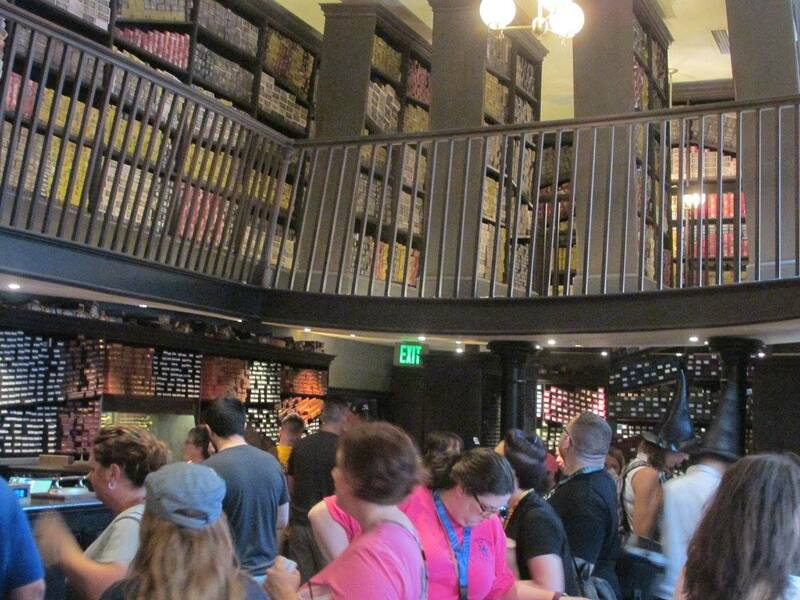 Many of the rides at Universal have lockers, and they're free for the first hour. But if it gets longer, they'll require a credit card to unlock it, too! 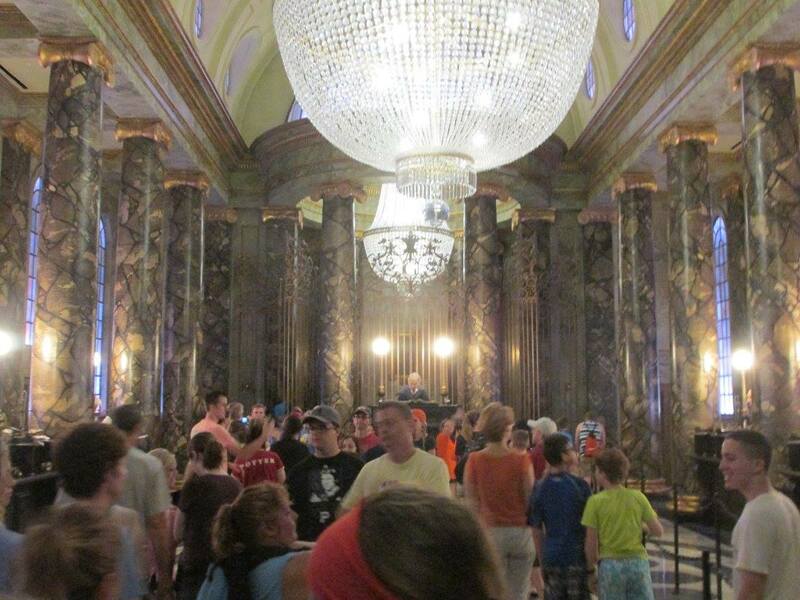 I also had never been in the main line for Gringott's, and it was beautifully done. The goblins working as tellers looked so real! Well, life-like, I should probably say. We went inside the main room and behind it to some elevators. We entered Bill Weasley's office, and he makes appearances frequently throughout the ride (naturally - he does work at the bank, after all). The ride itself is much more tame than Harry Potter and the Forbidden Journey, which is why I knew Dad would be okay. You're in a mine car, and people do jostle your car around with spells and dragons and such, but there's enough down time where you're watching stuff happen that it all works out. I prefer this attraction, and I enjoy the story! 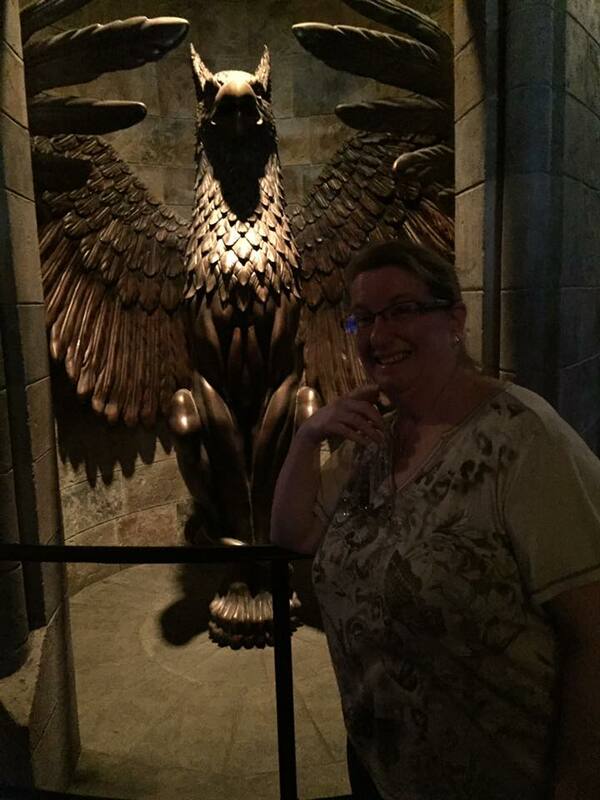 The next thing Mom wanted to do was get her wand. We entered Ollivander's and watched the cool little show they have, which is very similar to Harry's experience when he got his first wand. In a neat turn of events, the lady picked out two girls instead of just one. Both tried one wand and had negative results, but the lady just took the wands and switched them, and they both worked! That was clever. Then we got into line. While it was a long line, it went pretty quickly. Mom went out and found the wand that fit her - an oak wand. It took her a while, and Dad and I let a few people go ahead of us when we got to the front of the line. I had never bought a wand before, and I realized why when the guy told us the price - fifty bucks for an interactive wand! That took the gift card I'd gotten for Mom, plus a bit more. I hadn't thought the price was so expensive, or I would have added more to my gift card for her! But I paid for the rest of it, too. The guy apologized a couple of times for the line - I don't think he realized that we were more displeased with the price! We made it over to a shop and bought two butterbeers - one plain and one frozen. I much preferred the frozen butterbeer, while my Dad liked the plain. Mom actually wasn't a big fan! Dad and I chilled out and drank while Mom did some spells. You know, the usual stuff. We wandered around a little more and caught a showing of The Tale of the Three Brothers at the Carkit Market stage. 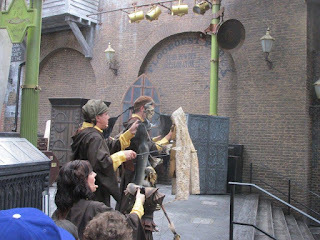 The puppets they use are supposed to look like the ones in Harry Potter and the Deathly Hallows (Part 1), and they do the job! The tale is fantastic anyway, and they do it very well. It was time for an early lunch (to avoid the long lines that build up), so we walked to the Leaky Cauldron. They have a queue for when the place gets busy, but we just walked right up to the counter. I got the Cottage Pie, and Mom and Dad split a Fish and Chips between the two of them. Very English, but very good. After we ordered, we were taken to a table, and the food was delivered to us. 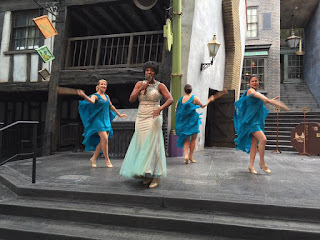 When we got out of lunch, Celestina Warbeck was putting on a show at the Carkit Market, so we were able to watch that show. That Celestina sure has a voice! Mom and Dad got over there before I did because I cleaned up our lunch, but as I was catching up to them, I was passing a water fountain that featured one of the mermaids as a statue. Apparently, this mermaid spits out water, and I watched a lady get water right in the face! The line for the Hogwarts Express was much longer this time, but there was plenty to see as we waited. I got a Snapchat video of Mom and Dad going through the brick wall, though I didn't clearly explain it to Dad, and he just stood there like I was going to take a picture. So you can hear me yelling, "Go! Go!" in the video, so even though you can see it happen, it wasn't as effective. I did get a very nice shot, though, of Mom and Dad in front of the Hogwarts Express. The windows show different things happening as you travel to Hogwarts than what you see on the way to London, so it was just as entertaining as the first time. 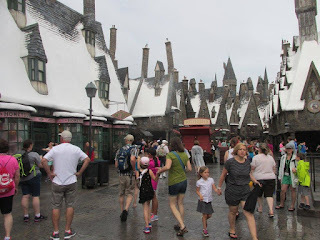 Hogsmeade was much hotter than Diagon Alley, since Diagon Alley has a lot more overhead shading, which ends up keeping the air conditioning trapped inside, while Hogsmeade is all open air. By this time of the day, the rain was completely gone and the sun was making it hot and muggy instead. Mom did a few interactive windows while I went into Honeydukes and purchased a gigantic Chocolate Frog and some Fizzing Whizzbees with raspberry flavoring. The Fizzing Whizzbees crackled in your mouth for a fun sensation, though I wish I had gotten a different flavor. Mom wanted to do Harry Potter and the Forbidden Journey one more time, but I bowed out this time, deciding to hang out with Dad. She went off to do the singles line, but about five minutes later I realized she didn't have her phone on her! 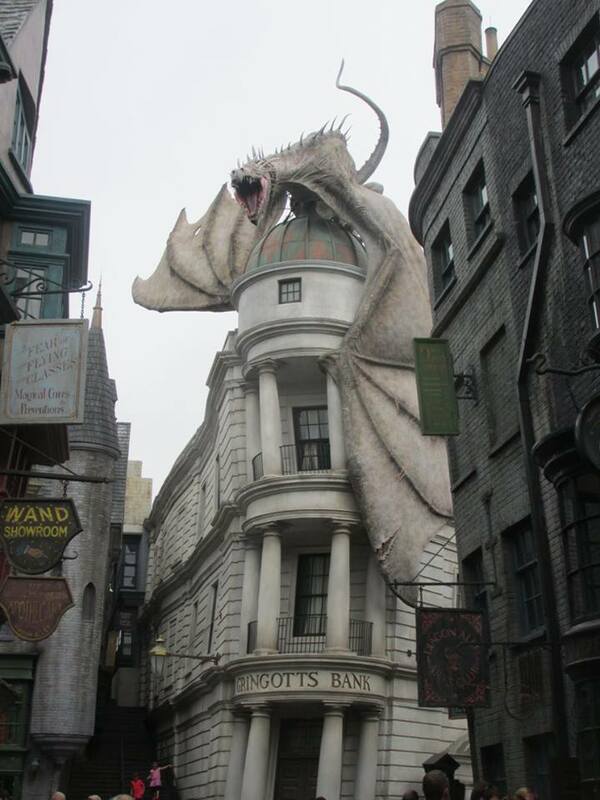 So Dad and I went to the gift shop (Filch's Emporium) to hopefully catch her when she exited the ride. And to my surprise, amongst the giant swell of people inside, we did! After a few more interactive windows, a visit to a few more shops, and a realization that it was really hot and we were really tired, Mom and Dad called it a day. It was about 2pm, so we had spent about 6 hours between the two Harry Potter experiences, which was all very worth it. Our walk back to CityWalk was looooooong, and we really took our time and made frequent stops. Mom found a short food line and got free cups of water (I honestly didn't think that Universal did that like Disney does!) for our ever-reliable water bottle. I'm so glad I packed that. We also stopped to eat a bit of our Chocolate Frog, and discover that our card was Salazar Slytherin, to Mom's chagrin. Dad still had a bit left on his Universal gift card that I'd gotten him for Father's Day, so we stopped at Jimmy Buffet's Margaritaville on CityWalk for a margarita! I have never seen a margarita disappear so fast between the three of us. We didn't wait long for a Cabana Bay bus, and in no time we were back to the resort. Our stuff was already in the car, so we took off for our off-site hotel. The hotel had comfy beds and good air conditioning, and that was honestly all we needed. We had dinner at a local Denny's and had a very nice waiter who chatted with us about good marriages and other things. That evening we just watched television, and I also showed a YouTube video of Fantasmic! to my parents, in place of the show that we didn't get to see the night before. After sleeping in, we had breakfast in the hotel before driving back to the airport. We didn't have any issues dropping off the car, checking in at the airline, and going through security, and before long we were at my parents' gate. We had lunch together, and then their plane started boarding and we said goodbye. Our flights had no problems, and when I was arriving back at my apartment in Aurora, my parents texted that they had just landed in Detroit! To say this was a successful vacation would be an understatement. There were so many things that went right! 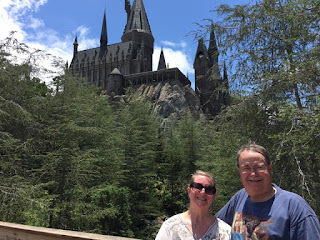 We didn't have any travel issues, our hotels were great, and aside from the PeopleMover and Fantasmic!, we didn't miss anything we had wanted to see! Better yet, everything my parents wanted to do twice, we were able to do! "Dad and I have been telling the story of our vacation to everyone that asks. The more we tell the story, the more appreciative we become. We had a BLAST! I enjoyed everything, and most of all, I enjoyed spending time with you! Thank you thank you THANK YOU! It was truly 'exhaustively awesome.'" 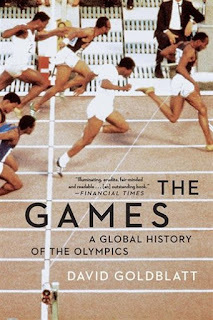 Stay tuned, because Blurb Musings is preparing for the Olympics! Starting August 5, Blurb Musings will be posting daily updates of the Summer Games that are taking place in Rio de Janeiro, Brazil. To get notifications of these articles, like Blurb Musings on Facebook or follow my blogs here on Google!